Admin users can see and do everything in MinuteDock, even track time on behalf of other users. 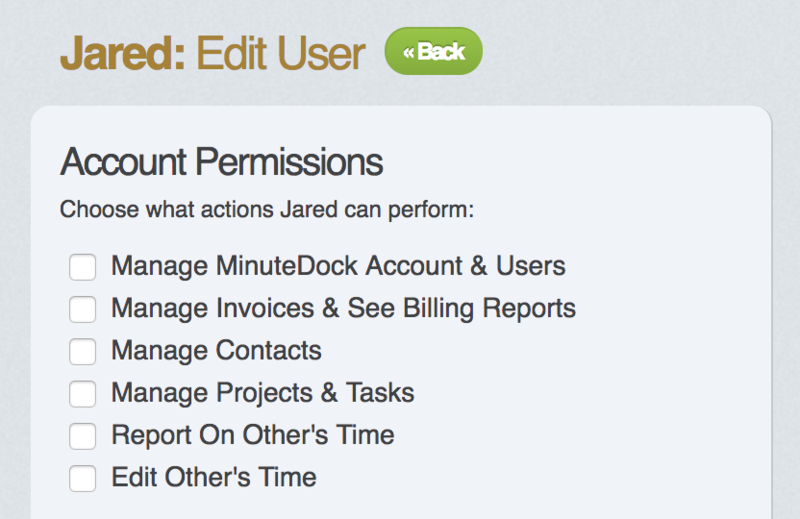 Admins can add/edit everything including users, projects, tasks, contacts, hourly rates and invoices. You can also make other users admins if you need to. Regular users can log time and see reports of their own time, but by default they won’t have the same visibility or permissions that an Admin has. Regular users cannot see hourly rates but if you have given permission for a User to manage contacts or projects/tasks then they can see the hourly rates linked to these. To see whether a user is an admin or a regular user, go to the Account tab. Yes or no will be in the ‘Admin’ column next to the user’s name. You can also tell if they’re a regular user if their account permissions are unchecked. To manage user permissions, click the 'manage' button next to the user's name.